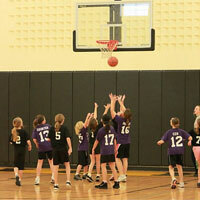 Registration for the NYAA Basketball season is open from October 1st to the 31st. Entry fees cover program costs including: gym rental, league fees, referee fees, uniforms, equipment, trophies, and miscellaneous expenses. Tryouts will be held in late October / early November. Schedule to be provided later. Girls and boys in Kindergarten through 2nd grade will be divided by grade and have group instruction two days per week. Instructional games will be organized later in the season. Emphasis of the K-2 program will be on the instruction of basic skills including: dribbling, passing, and shooting. Practices will begin the first weekend in January and run through the end of February. Tryouts will be offered in early November for 3rd and 4th grade boys to be selected to a team that will compete in the Lehigh Valley JV League. This league is considered a “travel” league and consists of other youth basketball programs throughout the Lehigh Valley. If there is enough interest from families and coaches, two or three teams may be selected to enter in this league. Tryouts and team selections will be in early November with games beginning in December running through February. Practices will begin in early November after teams are selected. Teams will typically practice two to three days per week depending on gym availability and the game schedule. Players who choose not to try out for one of the Lehigh Valley JV League teams, or are not selected, will be divided into teams that will compete in the Parkland Recreational League. The Parkland League consists of teams from several Parkland youth organizations. Practices are typically two days per week beginning in early December. Games are played in NW and Parkland gyms beginning in January and run through early March. Tryouts will be held in early November for selection to the travel team. Players who choose not to try out for the travel team, or are not selected, will be divided into teams that participate in the Parkland Intramural League. The Parkland League consists of teams from several Parkland youth organizations. Practices are typically two days per week beginning in December. 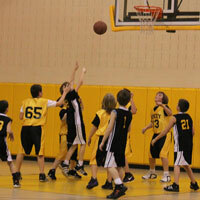 Games are played at NW and Parkland gyms beginning in January and running through early March. Tryouts will be offered in early November for 5th and 6th grade boys to be selected for one of three teams. One team will consist of mostly 6th grade boys and participate in the highly competitive Lehigh Valley Knee-Hi Basketball League (LVKBL). The LVKBL is considered a "travel" league and consists of teams from other youth organizations throughout the Lehigh Valley. The other two teams will compete in the Lehigh Valley JV League. This league is also considered a "travel" league and consists of teams from other youth organizations throughout the Lehigh Valley. Practices for these three teams are typically two to three days per week beginning in early November after teams are selected. Games begin in early December and run through February. Players who choose not to try out for one of the LVKBL or JV League teams, or are not selected, will be divided into teams that compete in the Parkland Recreational League. The Parkland League consists of teams from several Parkland youth organizations. Practices are typically two days per week beginning in early December. Games are played in NW and Parkland gyms beginning in January and run through early March. Tryouts will be offered for 5th and 6th grade girls to be selected for a team that will compete in the Lehigh Valley League. The Lehigh Valley League is a competitive “travel” league that consists of teams from other youth organizations throughout the Lehigh Valley. If there is enough interest from families and coaches, two teams may be selected to enter in this league. Tryouts and team selections will be in early November. Practices are typically two to three days per week beginning in early November after the team is selected. Games begin in late November running through February. Players who do not try out for the Lehigh Valley team, or are not selected, will be divided into teams that will compete in the Parkland Intramural League. The Parkland League consists of teams from several Parkland youth organizations. Practices are two days per week beginning in early December. Games are played in NW and Parkland gyms beginning in January and run through early March. 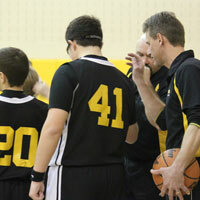 Boys in 7th and 8th Grade will be divided into teams that participate in the Parkland Recreational League. The number of teams will be determined by how many boys participate and coaches available. The Parkland League consists of teams from several Parkland youth organizations. Practices are typically two to three days per week beginning in early December. Games are played in NW and Parkland gyms beginning in January and run through early March. This division is for boys in 7th and 8th Grade who are selected to be on the NWL Middle School team. The team will participate in the highly competitive Lehigh Valley Knee-Hi Basketball League (LVKBL). The LVKBL is considered a "travel" league and consists of teams from other youth organizations throughout the Lehigh Valley. Practice times and locations will be posted and distributed as determined. Volunteer coaches are needed at all levels. A basketball coaching clinic will be scheduled for November (date and location to be determined). Parents interested in coaching should contact the basketball director. To help ensure the health and safety of young athletes, CDC developed the Heads Up: Concussion in Youth Sports initiative to offer information about concussions to coaches, parents, and athletes involved in youth sports.